Ever thought â€œi’d like to help out but i’m not sure what it is i can doâ€? 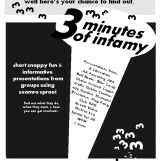 Want to become an active participant and get more fun outta Seomra Spraoi? Seomra Spraoi autonomous social centre is hosting a training session open to everyone who would like to help out and get involved, in whatever way they can, with the day to day running of the social centre. The aim of these training is to skill share, and to make it accessible for people to help out in a way that is inclusive and gives confidence to all. We aspire to have these skill shares as an ongoing thing , so as to have an ever growing pool of people working collectively. For all those interested in working at events within the space, we will have a really comprehensive and exciting training which cover all aspects of teamwork at events within the space. we will cover positive space policy, working and communicating as a team, and other issues that arise. This is a great opportunity to come along even if you are unsure of what you can commit to in the long term. Its about building and skill sharing and breaking down formal and informal hierarchies and changing the social and working relationships we’ve been culturally ingrained with. Hope to see ya there, oh and don’t forget the people’s kitchen is on from 2pm! for the Supporto Legale network. Brand new English version. [Ireland, 2002]. By Indymedia Ireland/Eamon Crudden. [Italy, 2007]. 42 min. English version. 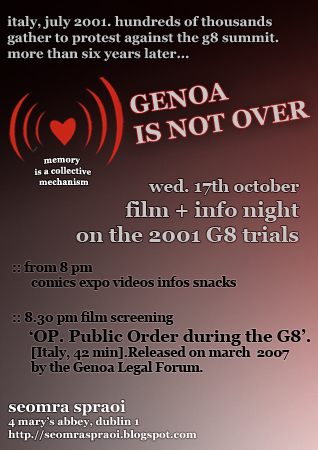 Produced by the Secretariat of the Genoa Legal Forum. OP is a detailed examination of the events of the 20th of July 2001, when marches and rallies around the red zone were heavily attacked by the police. Through maps, recordings of police radio communications and other evidence gathered in the course of the trial against 25 demostrators, the film exposes the way the police forces turned the streets of Genoa into a war zone. Who was the real threat to Public Order at the 2001 G8? 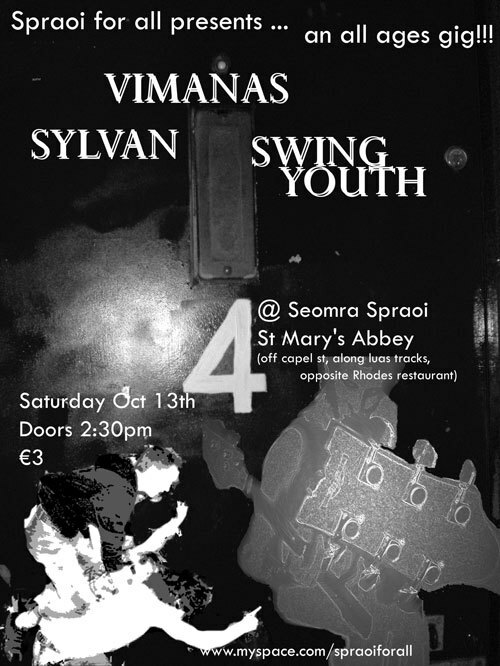 Spraoi for all â€” All ages gig on Saturday October 13th at Seomra Spraoi. Doors open at 2.30pm, â‚¬3, all welcome. With Vimanas, Sylvan, Swing Youth. All footage was shoot over the launch weekend, music by unsigned Dublin based bands and still images by photographer William Hederman. Thanks for people tolerating intrusive cameras over the weekend. Drop down, watch the documentary, any suggestions for changes more than welcome. This is followed by the film Dancer in the Dark. Dancer in the Dark is an award-winning musical film drama released in 2000. It was directed by Lars von Trier and stars BjÃ¶rk GuÃ°mundsdÃ³ttir, Catherine Deneuve, David Morse, Vladica Kostic, Cara Seymour and Peter Stormare. The soundtrack for the film, released as the album Selmasongs, was created entirely by BjÃ¶rk. Meet activists who have helped to build one of the most hopeful experiments in self management and people’s power in recent years. This Sunday, October 7th â€” starts at 5pm following the people’s kitchen @ 2pm. Showing several short videos, with discussions from indymedia, and local Oaxaca community radio activists from across a wide range of topic including police repression, community organisng,creating media to carry the voices of struggles and making real links, local stuggles both in the global north and south against global capitalism and neo liberal oppression. For over a year Oaxaca in the south of Mexico has witnessed the massive growth of strong and vibrant social movements. Unsurprisingly, the state has responded to people power with violence and repression. The broad based social movements, which include unions and community groups, have developed new forms of popular media. Activists involved in the social movements and in alternative radio and Indymedia will be speaking in Dublin this Sunday (7/10/07) in Seomra Spraoi at 5 pm. 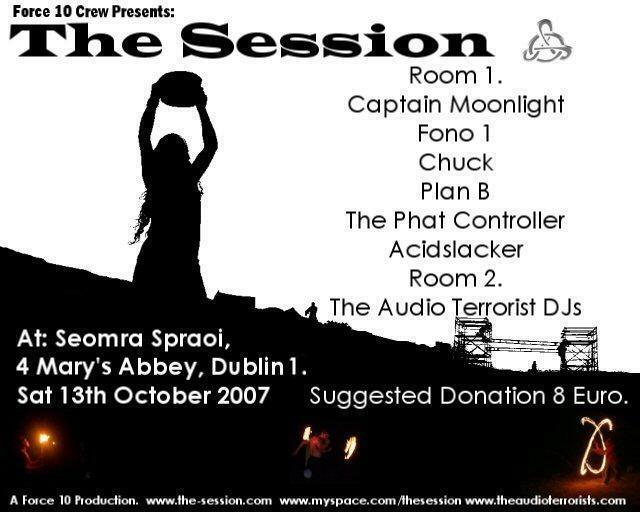 Seomra Spraoi is self-managed social centre in the heart of Dublin(Mary’s Abbey just off Capel street just follow the Luas line in the direction away from town). All are welcome. More details on the talk will be available tomorrow. This weekend come and see our lovely new space!!! The space is open all weekend for people to drop in and drink tea and look around any time from 12 midday onwards. 7pm, Trad night â€” traditional music session, bring your instrument or just come to listen. 7pm Contemporary Storytelling â€” You are invited to find out what Irish storytelling is, was and what it might be. Seomra Spraoi is an autonomous social centre. We are a collective of different people with different backgrounds and interests working together in co-operation with a common purpose, to create a non-comercial space with an atmosphere of tolerence and respect, and a sense of community. The centre is run on libertarian principles and participatory democracy, it is independant of any political party, business etc. and everyone involved has an equal voice in deciding how it is run. We’ve been at 4 Mary’s Abbey, just off Capel St (on the luas line) for 2 months now and although we’ve had lots going on, we haven’t really taken the time to stop and celebrate and show it off! 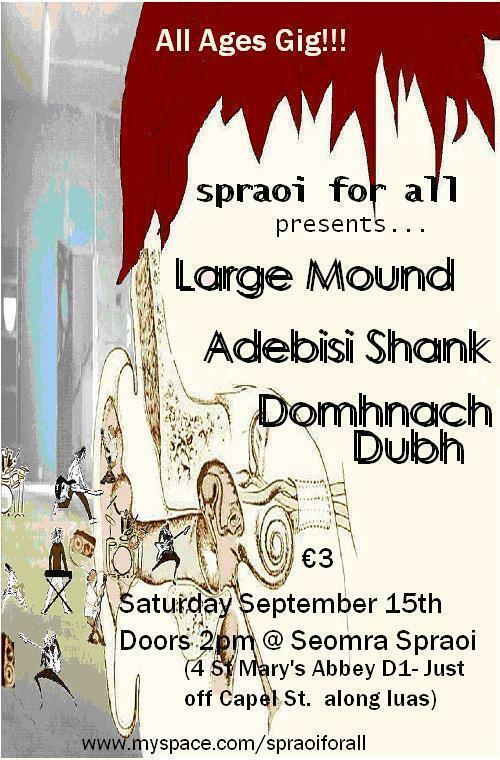 This is the first of what we hope to be regular seomra spraoi all ages events. Come along and get involved. You are invited to forget what Irish storytelling was, and find out what it might be. Show starts 9 pm. Doors 8.30 pm. Soft drinks and biscuits will be served in the break. Proceeds to the Seomra Spraoi. 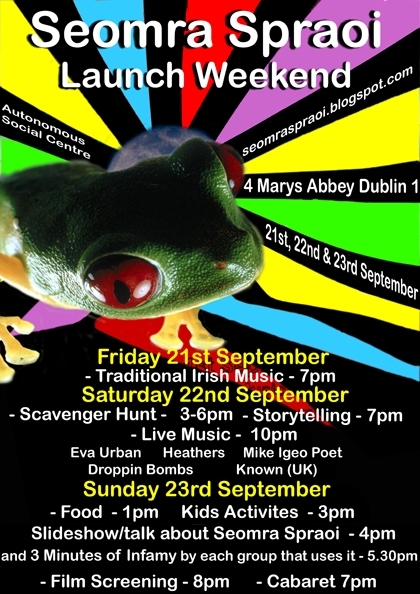 The Seomra Spraoi is delighted to host an evening of storytelling with a performer who has already done a lot to promote his art as an innovative form of entertainment for savvy young urbanites. CoilÃ­n Oh-Aissieux is the founder and a co-organiser of the Narrative Arts Club, which has brought innovative storytelling to young adults in Dublin since November 2005. This is something modern, perplexing and thoroughly engaging, which knows no boundaries and succumbs to few taboos. Coilin performs from a very diverse repertoire, ranging from accounts of his own misadventures with mushroom soup to shamanic tales from Greenland, the Arabian Nights and the Tibetan saga, Gesar of Ling. He also performs the old Irish saga, Mael Dun’s Voyage, though he wouldn’t like his work with Irish motifs to overshadow his international repertoiire. Coilin is looking forward to performing for members and friends of the Seomra Spraoi. At a recent meeting of the collective, he told us how he wants to reclaim some of the territory that has been captured by corporate media such as the cinema, and to establish storytelling as a form of entertainment that is just as relevant as movies like Trainspotting and Fight Club. If the response is good, he is prepared to make it a series of evenings for us in the Seomra Spraoi. So come on over, and invite your friends. Let’s see a good crowd for this first new event, so he knows we want him to come again. Phone your friends and invite them in person!